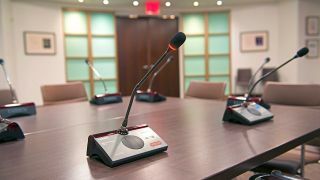 Media Vision is shipping its newest digital infrared wireless conference microphones, Series TAIDEN HCS-5300/80, that can be combined with wired and multimedia units into one system. The wireless solution offers flexibility with room-combining capability of up to four meeting spaces; now with the added versatility of wired/wireless combinations. In other company news, Media Vision is offering an online course outlining the physical attributes and characteristics of digital infrared wireless systems, and reviewing the best practices for surveying a site and specifying the required components. This online course is approved for 1 CTS renewal credit and can be scheduled online, here. "The interference-free performance and inherent security of digital infrared solutions is what has turned the HCS-5300 wireless conference system into the most successful product line offered by Media Vision for the past seven years," according to a company statement. The HCS-5300 is well suited for multipurpose, divisible meeting spaces as the solution can be used in adjacent rooms and microphones can easily be shared between rooms without need to change settings. In addition, the HCS-5300 wireless system offers eight channels (expanded from four) for use in applications requiring simultaneous interpretation. The possibility to receive up to seven languages, with dual-language selector option, makes the TAIDEN solution flexible for multilingual applications.